May was an extremely hectic month for GG. It started with a last minute e-mail from the Kickplate Project asking us to attend the opening of their 76m2 gallery in Pontypool on May Day. Fortunately, seven dancers plus our musicians were available, and we carried out a short programme of dances in the rather cramped interior of the gallery, where the project’s artists had created ceramics to look like Pontypool’s famous Japanware. The Kickplate Project has been bringing art, mainly in the form of photographic exhibitions, to various valley communities. The building, on Commercial Street, also houses a darkroom for the community to use. The gallery will be open between Feb and Dec 2017, when the project will move on to another venue in a different town. We then had a weekend’s breather before our next outing at the Tredegar House Folk Festival. 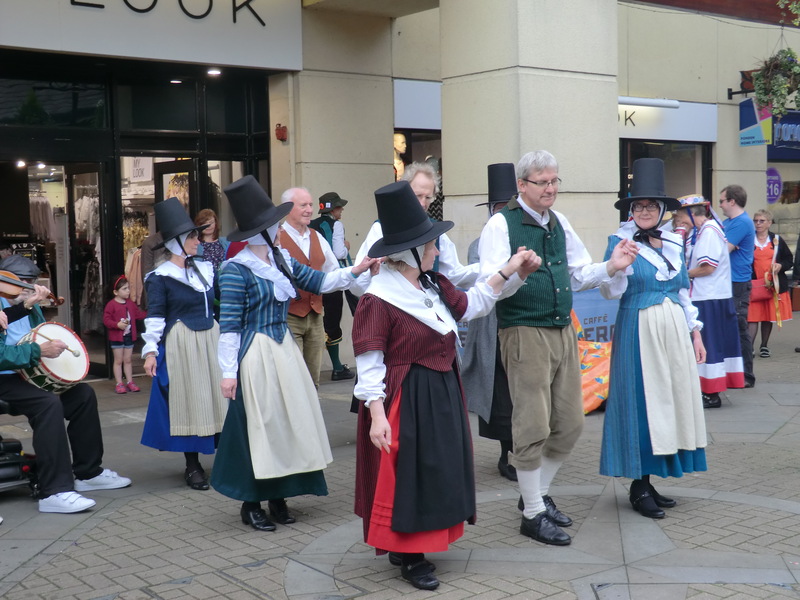 We had a spot in both dance pavilions on Saturday 13th along with 15 other sides, including groups from the Czech Republic, Latvia, Cornwall and London. The sun shone over the weekend, there was loads of great music and dancing, plenty of real ale was consumed, and a good time was had by all. The following Saturday, we were off to Bradford-on-Avon for their inaugural Day of Dance. This consisted mainly of Morris and Appalachian sides with GG there to provide a contrast. A very pretty place to dance, but unfortunately the last dance spot of the day plus the procession had to be cancelled because the heavens opened. Some Morris sides seemed happy dancing in the pouring rain, but with our Welsh flannel costumes we just had to take shelter. With hardly time to draw breath, we were off again the following weekend to the Chippenham Folk Festival. This time we stayed overnight and danced both Saturday and Sunday at various venues throughout the town. The weather this time was warm and sunny. In fact it was a bit too warm for our appearance inside the big top pavilion on Sunday afternoon. We performed our two liveliest dances, so thank goodness each group was only allocated a 10 minute spot! A very successful children’s dance festival (Gwyl Plant Gwent) was held over 3 weekends in June/July, organised as usual by several members and ex-members of GG. For the first time in many years, the weather allowed all three events to take place outdoors.....in Cwmbran town centre, Newport Sports Village and the grounds of Abergavenny Castle. On Saturday 8th July we took part in our 3rd annual Henllys Village Fete. On a very warm day we performed 3 spots on the road outside the village hall. 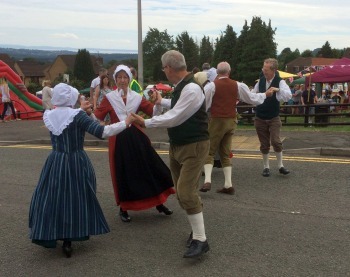 A lot of people turned out and enjoyed the fine weather and entertainment, which also included Isca Morris Dancers.